Here, optimized methods to generate in vivo and in vitro models of hepatic steatosis and to analyze the steatotic phenotypes and related physiological parameters are described. Cui, A., Hu, Z., Han, Y., Yang, Y., Li, Y. Optimized Analysis of In Vivo and In Vitro Hepatic Steatosis. J. Vis. Exp. (121), e55178, doi:10.3791/55178 (2017). Establishing a system of procedures to qualitatively and quantitatively characterize in vivo and in vitro hepatic steatosis is important for metabolic study in the liver. Here, numerous assays are described to comprehensively measure the phenotype and parameters of hepatic steatosis in mouse and hepatocyte models. Combining the physiological, histological, and biochemical methods, this system can be used to assess the progress of hepatic steatosis. In vivo, the measurements of body weight and nuclear magnetic resonance (NMR) provide a general understanding of mice in a non-invasive manner. Hematoxylin and Eosin (H&E) and Oil Red O staining determine the histological morphology and lipid deposition of liver tissue under nutrient overload conditions, such as high-fat diet feeding. Next, the total lipid contents are isolated by chloroform/methanol extraction, which are followed by a biochemical analysis for triglyceride and cholesterol. 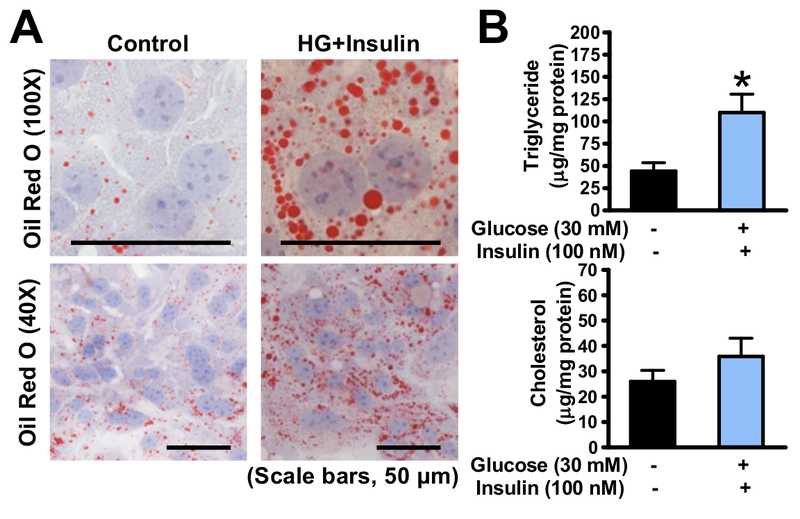 Moreover, mouse primary hepatocytes are treated with high glucose plus insulin to stimulate lipid accumulation, an efficient in vitro model to mimic diet-induced hyperglycemia and hyperinsulinemia in vivo. Then, the lipid deposition is measured by Oil Red O staining and chloroform/methanol extraction. Oil Red O staining determines intuitive hepatic steatotic phenotypes, while the lipid extraction analysis determines the parameters that can be analyzed statistically. The present protocols are of interest to scientists in the fields of fatty liver diseases, insulin resistance, and type 2 diabetes. Obesity is a burgeoning health problem in developed and developing countries. It has been reported to be one of the coexisting conditions frequently associated with nonalcoholic fatty liver disease (NAFLD), with a prevalence ranging between 30 and 100 percent in NAFLD patients1. Due to the strong correlation between fatty liver and obesity, diet-induced obese (DIO) mouse models are widely used to study the complex molecular mechanisms associated with the development of NAFLD2,3,4,5,6. Hepatic steatosis is the earliest stage of NAFLD, and it can progress to nonalcoholic steatohepatitis (NASH), cirrhosis, and ultimately, liver cancer7. Therefore, the overall goal of this method is to generate animal and cell models of hepatic steatotic conditions and to provide detailed protocols for efficient and accurate lipid measurement. These models and measurements are also useful for the investigation of other metabolic disorders, such as insulin resistance and type 2 diabetes. As obesity is identified to be one of the key risk factors for NAFLD, a high-fat, high-sucrose diet (HFHS) that imitates the Western-style high-fat diet is used to induce obesity in mice. Subsequently, the degree of hepatic steatosis can be assessed using different methods. First, body weight and body composition analysis with nuclear magnetic resonance (NMR) show the lipid accumulation during feeding time. The fat mass and lean mass can be quantified in a non-invasive and real-time manner. In addition, magnetic resonance imaging (MRI) is used to show both the whole-body and the liver distribution of fat. The grayscale signal of the MRI analysis can be converted into a legible pseudo-color image, and the intensity of the grayscale and color is hemi-quantifiable. This technology provides unique advantages for the measurement of lipid accumulation in live animals. Second, histological analysis of the liver is the most commonly used method to determine hepatic steatosis. Hematoxylin and Eosin (H&E) staining provides histological information, such as hepatocyte morphology and macrophage infiltration, while Oil Red O staining shows the size and position of the lipid droplets in hepatocytes. Third, the lipid content analysis using chloroform/methanol extraction is an accurate and quantitative measurement of hepatic lipids. Total triglyceride and cholesterol levels can be measured with biochemical methods. Importantly, lipid extraction analysis and Oil Red O staining can also be used in genetically manipulated or pharmaceutically treated hepatocytes. The advantage of the present method is its utilization of multiple optimized approaches to generate hepatic steatotic models and to comprehensively characterize the phenotypes both in vivo and in vitro. The DIO mouse models can recapitulate the pathology and metabolic phenotypes of human fatty liver disease. Other metabolic parameters in humans can be replicated in this model as well8. The generation of the steatotic hepatocyte model in response to high glucose plus insulin is efficient, useful, and overcomes the limitation of costly and time consuming mouse work. Taken together, these methods are sufficient and essential for the study of hepatic lipid dysfunction and insulin resistance during nutrient overloading. All animal experimental protocols were approved by the institutional animal care and use committee at the Institute for Nutritional Sciences, Shanghai Institutes for Biological Sciences, Chinese Academy of Sciences (Shanghai, China). Feed the eight-week-old male C57BL/6 mice with an HFHS that contains 40 kcal% fat and 40 kcal% sucrose. House them in 12 h dark-light cycle conditions. Keep the mice in HFHS diet-feeding condition for four to sixteen weeks. Check the body weight weekly. Subject the mice to a body composition analyzer analysis. Secure conscious, not anesthetized mice in a plastic tube in the. Measure the body fat mass, lean mass, and fluids using an NMR system, as described previously2. Scan the whole body of each mouse using an MRI system. Anesthetize the mice with 1% avertin via intraperitoneal injection (25 µL/g) and perform the imaging analysis in specialized glass tubes. NOTE: The process of imaging lasts for nearly 0.5 h for each mouse. When the measurement is completed, return the mice to their cage. Scan the whole bodies of the mice in dorsal, middle, and ventral layers; scan the liver in the vertical direction. Use a 0.55 T magnet and the following instrumental parameters: K space = 192 x 256 µm, section thickness = 3 mm, TE = 14.8 ms, TR = 400 ms, FOVRead = 100 mm, FOVPhase = 100 mm, and number of scans = 8. Scan using the same magnetic condition for the all groups of mice. Map the grayscale image onto a pseudo-color image according to the signal intensity9. Sterilize dissecting tools, such as forceps and scissors. Pour sufficient isoflurane on a paper towel and let the isoflurane volatilize in a glass jar. Ensure that the mice are euthanized by the isoflurane. Fix the mice on an operating table. Spray each abdomen with 75% ethanol, make an incision in the dermis of the xiphoid process using scissors, and tear the dermis lengthwise through the midline with the hands to expose the peritoneum. Clamp the xiphoid process with forceps and cut the peritoneum breadthwise through the bottom of the ribs to expose the viscera. Collect blood in EDTA-coated tubes by cardiac puncture. Cut the diaphragm along the liver and carefully remove the liver from the enterocoelia using fine scissors. Cut three pieces of liver tissue for the following lipid measurements: a) 6 x 3 x 3 mm for H&E staining, b) 6 x 3 x 3 mm for Oil Red O staining, and c) 20-40 mg of liver for chloroform/methanol extraction. Fix the liver in 4% phosphate-buffered formalin acetate at 4 °C overnight and then embed it in paraffin wax. Cut paraffin sections (5 µm) and mount them on glass slides for H&E staining, as previously described3,10. Prepare Oil Red O working solution with 10% formalin, 60% isopropanol, Hematoxylin, and glycerol jelly. Dissolve 0.5 g of Oil Red O powder with 100 mL of isopropanol and heat it in a 60 °C bath to make a 0.5% stock solution. Dilute with double distilled water (ddH2O) at a 3:2 ratio (3 mL of stock solution and 2 mL of ddH2O). Filter the working solution and let stand for at least 10 min at room temperature. Embed the liver in optimum cutting temperature (OCT) compound in a plastic embedding box. Freeze it at -20 °C for 30 min. Cut it into 8-µm sections in a freezing microtome, mount the tissue on a slide, and place it at room temperature for 30 min. Place a paper towel in the bottom of a staining tub and pour a small amount of 10% formalin to wet the paper towel. Place the slide in the staining tub and fix the frozen sections in formaldehyde vapors for 5 min at 4 °C. Dip the slide in 60% isopropanol in the staining tub for 3 s; repeat once. Add a few drops of Oil Red O working solution to the slide to cover all tissue and incubate for 15 min. Protect the tissue from light at room temperature. Rinse the slide in new 60% isopropanol in the staining tub for 3 s; repeat twice. Gently rinse the slide through distilled water twice and remove the water around the tissue. Be sure not to dry the tissue. Place the slide in Hematoxylin for 1 min and rinse gently with tap water for 5-10 min. Gently rinse the slide in distilled water twice and keep the it in distilled water until ready to put on the coverslip. Heat up the glycerol jelly in the microwave and place several drops on top of the tissue. Gently place the coverslip on top and take care not to form bubbles. Observe the stain under a microscope and capture characteristic pictures using 20X and 40X objectives. Place the dissected liver tissue in a new 2-mL plastic centrifuge tube. Homogenize in 1 mL of PBS with a homogenizer and transfer the lysate to a new 15-mL glass tube. Add 5 mL of chloroform/methanol (2:1, v/v) solution, vortex the mixture vigorously for 1 min, and let stand for 2 h on ice. Centrifuge at 1,650 x g for 10 min at 4 °C; the mixture should separate into 3 layers: the upper methanol layer, the middle protein disc, and the bottom chloroform and lipids. Transfer the bottom phase into a new glass tube using a glass Pasteur pipet; there is no need to get every drop of the bottom fraction. Set the tube aside on ice. Add 600 µL of 4 mM MgCl2 and 1.5 mL of chloroform to the supernatant fraction left in the previous tube and vortex vigorously. Incubate on ice for 30 min and centrifuge at 1,650 x g for 10 min at 4 °C. Combine the bottom phase with the first bottom phase tube using Pasteur pipet. Discard the upper and middle layers. Evaporate the chloroform under nitrogen gas in a 37 °C bath. Wash the sides of the glass tubes thoroughly with 200 µL of 1% Triton X-100/chloroform (v/v). Evaporate under nitrogen gas. Dissolve the lipid with 200 µL of ddH2O and vortex well to make the final emulsion. Measure the total triglyceride (TG) and cholesterol (TC) levels by using a triglyceride or cholesterol kit according to the manufacturer's protocol3. NOTE: The lipid values are normalized to those of the protein concentrations in the initial homogenate, as determined by protein quantification3. Anesthetize each mouse with 6% chloral hydrate (10 µL/g intraperitoneally). Isolate primary hepatocytes, as previously described10. Grow cells on collagen-coated glass coverslips in a 6-well plate for Oil Red O staining. For lipid extraction, seed the cells onto a 10-cm cell culture dish10. Replace the medium with 2 mL of starvation medium and incubate at 37 °C for 24 h. Treat it with 30 mM glucose and 100 nM insulin. Incubate it in a 37 °C culture incubator for 24 h.
Aspirate the medium. Add 2 mL of PBS and swirl gently to rinse the medium; repeat once. Fix the coverslip to the slide with a rubber band. Expose the cells adherent to the outside surface. Perform the Oil Red O staining as described above (step 1.5). NOTE: The basal levels of lipid accumulation are stimulated with a high glucose plus insulin treatment after serum starvation. The lipid drops are visualized by Oil Red O staining. Treat the hepatocytes with high glucose plus insulin in the same condition (step 2.2.1). Add 1 mL of PBS to each 10-cm cell culture dish. Scrape off the cells and harvest them into new 15-mL glass tubes, from which aliquots of 100 µL are transferred to fresh 1.5-mL tubes for protein quantification. Add 4 mL of Chloroform/Methanol (2:1, v/v) to the remaining 900 µL of cells. Sonicate for approximate 20 beeps and then vortex vigorously to release the lipid in the cells. Incubate the mixture on ice for 2 h. Perform the lipid extraction (step 1.6). 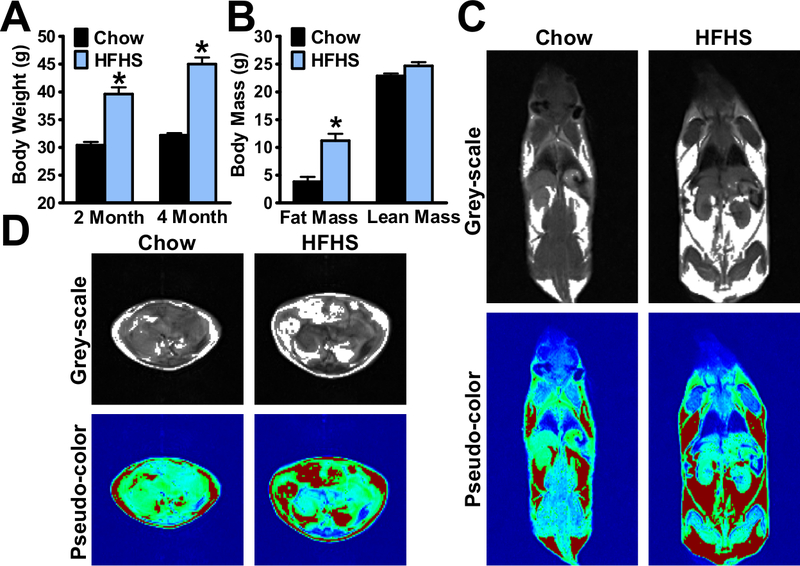 As shown in Figure 1A, the mouse body weight was increased to 45±1.2 g after 16 weeks of HFHS feeding, which is approximately 1.5-fold higher than chow diet feeding group. The NMR body composition analyses showing the fat mass and lean mass of mice are indicated (Figure 1B). The fat distributions of the whole body and of the liver were determined by MRI, and representative pseudo-color images in live, conscious mice are shown in Figure 1C-D. The body weight and body composition were measured and visualized during the HFHS diet feeding process. To further dissect the steatotic phenotypes, the mice were sacrificed and a liver histological analysis was performed. The H&E and Oil Red O staining of the livers are shown in Figure 2A-B, in which lipid droplets grow larger and occupy the spaces in most hepatocytes after 4 months of HFHS diet feeding. The degree of hepatic steatosis of HFHS diet-fed mice is easily visualized by comparing with chow diet-fed mice. The main components of the lipid, such as triglyceride and cholesterol, were measured with chloroform/methanol extraction (Figure 2C). In DIO mice, the excess nutrient overload caused abnormal triglyceride accumulation in the liver. With data from NMR, MRI, and histological analysis, the degree of lipid deposition can be determined efficiently and accurately. As shown in Figure 3, the lipid levels in primary hepatocytes were induced by high glucose plus insulin for 24 h. The accumulated lipid droplets were determined by Oil Red O staining (Figure 3A), and the quantitative lipid analysis was used subsequently to measure the triglyceride and cholesterol levels in hepatocytes (Figure 3B). Based on this model, the effects of genetic modification or pharmaceutical treatment on lipid homeostasis in hepatocytes can be investigated in an efficient and rapid way. Figure 1. High-fat, high-sucrose diet (HFHS) increases obesity and hepatic steatosis in mice. Eight-week-old male C57BL/6 mice were fed on a chow or HFHS diet for 8 weeks and 16 weeks, respectively. (A) Body weight of the mice. (B) Body composition of the mice. (C-D) Representative magnetic resonance image of the mouse and liver. The white area in the grey-scale image indicates the fat, while the red area in the pseudo-color image indicates the fat. The data are represented as the mean ± the standard error (SEM), n = 5-8. *p < 0.05 versus the chow diet-fed mice. The error bars represent the SEM. Statistical analysis was performed using an unpaired, two-tailed Student's t-test. Please click here to view a larger version of this figure. Figure 2. Analysis of hepatic steatosis in mice fed with an HFHS diet. Eight-week-old male C57BL/6 mice were fed on a chow or HFHS diet for 8 weeks and 16 weeks, respectively. (A) Representative gross morphology of enterocoelia and liver. (B) Representative H&E and Oil Red O staining (scale bars: 50 µm). Oil Red O stains the fat and neutral fat, and red dots indicate lipid droplets accumulated in hepatocytes. (C) Total triglyceride and cholesterol levels of the liver lipid extractions using the chloroform/methanol method. The data was normalized to the liver weight, and are represented as the mean ± the standard error (SEM), n = 5-8. *p < 0.05 versus the mice fed with chow diet. The error bars represent the SEM. Statistical analysis was performed using an unpaired, two-tailed Student's t-test. Please click here to view a larger version of this figure. Figure 3. Hepatic steatosis is induced in mouse primary hepatocytes exposed to high glucose plus insulin. (A) Oil Red O staining of cultured primary hepatocytes treated without or with glucose and insulin, as indicated (scale bars: 50 µm). (B) Triglyceride level in the primary hepatocytes was measured and normalized to the protein concentration. The data are represented as the mean ± the standard error (SEM). *p < 0.05 versus the control group. The error bars represent the SEM. Statistical analysis was performed using an unpaired, two-tailed Student's t-test. Please click here to view a larger version of this figure. NAFLD is a series of progressive liver diseases that is associated with metabolic syndrome, obesity, insulin resistance, or type 2 diabetes mellitus (T2DM)11. The hallmark of NAFLD is steatosis, the accumulation of lipid in hepatocytes. Here, a spectrum of methods is presented to characterize the phenotypes and parameters of hepatic steatosis using DIO mice and mouse primary hepatocytes. This procedure could be helpful to elucidate the molecular mechanisms of NAFLD and other related metabolic diseases. Combining in vivo and in vitro assays, these methods provide comprehensive analyses and assessments of hepatic steatosis. Currently, animal models of NAFLD mainly consist of genetic and nutritional models. The HFHS diet used here is intended to imitate the modern diet style and is sufficient to induce obesity and hepatic steatosis in mice. However, to study the molecular mechanisms in the development of lipid deregulation, the cell-based assay contains obvious advantages over animal study, including easy manipulation by genetic mutation or pharmacological treatment, as well as relatively low costs and time commitments. To generate hepatic steatosis in mouse primary hepatocytes, high concentrations of glucose plus insulin are used to induce lipid accumulation, which is a novel and efficient in vitro model to mimic in vivo diet-induced hyperglycemia and hyperinsulinemia. This treatment is also applicable to other hepatic cell lines, such as HepG2 cells. Given that genetically modified hepatocytes are accessible to a variety of pharmaceutical treatments, the in vitro steatotic model described here overcomes the limitation and time-consuming steps for the generation of animal models using gain- and loss-of-function approaches. The body composition analyses, including NMR and MRI, provide the non-invasive and real-time data on lipid in the whole body and liver. It is a non-invasive, time-saving, visualizable, and semi-qualitative measurement. In addition, the accuracy of body composition analyses can be greatly improved by combining other histological and biochemical measurements. It is critical and necessary to determine hepatic steatosis in vivo and in vitro using H&E staining, Oil Red O staining, and lipid measurement, all of which are gold-standard measurements for diagnosing and grading hepatic steatosis. One of the limitations of the present method is its inability to measure inflammation and collagen deposition when simple steatosis progresses to hepatitis, fibrosis, and ultimately, cirrhosis and liver cancer. Given that diet-induced obese mice have a low-risk for the development of NASH, the current protocol is sufficient to evaluate hepatic steatosis in DIO mice. However, in the condition of NASH, other biochemical measurements, such as plasma alanine aminotransferase (ALT) and aspartate aminotransferase (AST) levels, should be utilized. Funding: This work was supported by grants from the National Natural Science Foundation of China (No. 81270930, 31471129, and 31671224) and the Hundred Talents Program of the Chinese Academy of Sciences (2013OHTP04) to Y.L. We appreciate Feifei Zhang for the helpful discussions. We are grateful to Jing Gao and Yixuan Sun for the technical assistance and to Zhengshuai Liu and Fengguang Ma for the animal studies. Angulo, P. Medical progress - Nonalcoholic fatty liver disease. New England Journal of Medicine. 346, (16), 1221-1231 (2002). Chen, X., et al. Hepatic ATF6 Increases Fatty Acid Oxidation to Attenuate Hepatic Steatosis in Mice through Peroxisome Proliferator-Activated Receptor Alpha. Diabetes. 65, (7), 1904-1915 (2016). Li, Y., et al. AMPK phosphorylates and inhibits SREBP activity to attenuate hepatic steatosis and atherosclerosis in diet-induced insulin-resistant mice. Cell Metab. 13, (4), 376-388 (2011). Li, Y., et al. Hepatic SIRT1 attenuates hepatic steatosis and controls energy balance in mice by inducing fibroblast growth factor 21. Gastroenterology. 146, (2), 539-549 (2014). Esau, C., et al. miR-122 regulation of lipid metabolism revealed by in vivo antisense targeting. Cell Metabolism. 3, (2), 87-98 (2006). Kanda, H., et al. MCP-1 contributes to macrophage infiltration into adipose tissue, insulin resistance, and hepatic steatosis in obesity. Journal of Clinical Investigation. 116, (6), 1494-1505 (2006). Cohen, J. C., Horton, J. D., Hobbs, H. H. Human fatty liver disease: old questions and new insights. Science. 332, (6037), 1519-1523 (2011). Hebbard, L., George, J. Animal models of nonalcoholic fatty liver disease. Nat Rev Gastroenterol Hepatol. 8, (1), 35-44 (2011). Chen, Y., et al. Highly effective inhibition of lung cancer growth and metastasis by systemic delivery of siRNA via multimodal mesoporous silica-based nanocarrier. Biomaterials. 35, (38), 10058-10069 (2014). Gong, Q., et al. Fibroblast growth factor 21 improves hepatic insulin sensitivity by inhibiting mammalian target of rapamycin complex 1 in mice. Hepatology. 64, (2), 425-438 (2016). Anstee, Q. M., Targher, G., Day, C. P. Progression of NAFLD to diabetes mellitus, cardiovascular disease or cirrhosis. Nat Rev Gastroenterol Hepatol. 10, (6), 330-344 (2013).